Teach at Breakthrough. Be Transformed. Lead your own classroom. Experience firsthand what it’s like to teach, motivate, and inspire students. Learn from your students and colleagues. Grow as a leader and an educator. 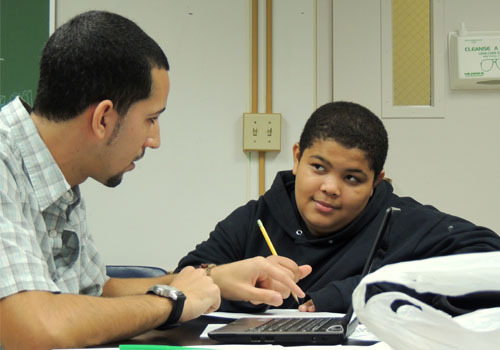 Breakthrough Providence will challenge you to make a profound impact in students’ lives — and your own. The School Year Program application is now closed. The application for School Year Program 2019-2020 will become available in Fall 2019. Please check back for more information soon! The Summer 2019 teaching fellow application is now available on the Breakthrough Collaborative website! Start by getting to know us by navigating to the above links and the Summer Teacher Roles & Responsibilities. Read the application instructions and get started. (Important: rank Providence your first choice site if you want to work here.) Please give the application your time and focus. We get hundreds of applications for just 24 spots, and your essays and references help us get to know you. Apply here for our Summer 2019 teaching positions. Questions? Contact Marisa Chock, Co-Director at (401) 528-2152 or mchock@breakthroughprovidence.org.